Platform-as-a-Service (PaaS) solutions are increasingly popular and can speed time to market while cutting costs, but they are not for all organizations and they are not all the same. Before a business can ask whether PaaS makes sense, it must first understand its own needs and the differences among the wide variety of PaaS offerings. Then it must consider the realities of its existing infrastructure and staff and how to best integrate those resources with service-based offerings. PaaS solutions have been in the background for years, but they now range from traditional PaaS, which simply abstracts out the infrastructure for a single hosting provider, to PaaS solutions that provide model-based app building and deploy to public, private, and hybrid clouds. 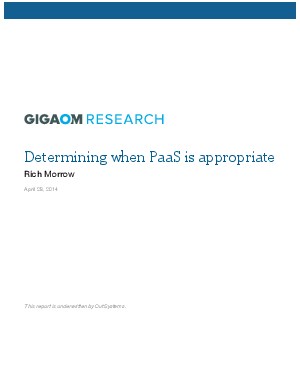 Organizations should be investigating choices and choosing a PaaS provider now to guard against cloud-provider lock-in. The number of savvy developers a company has combined with its availability are primary criteria for determining if PaaS is the right choice and how much productivity gain can be realized.